I can tell you that, driving down to Monterey less than two weeks ago, there was scarcely a square inch along the farm stretch of Highway 1 that did not have massive numbers of pumpkin stands. 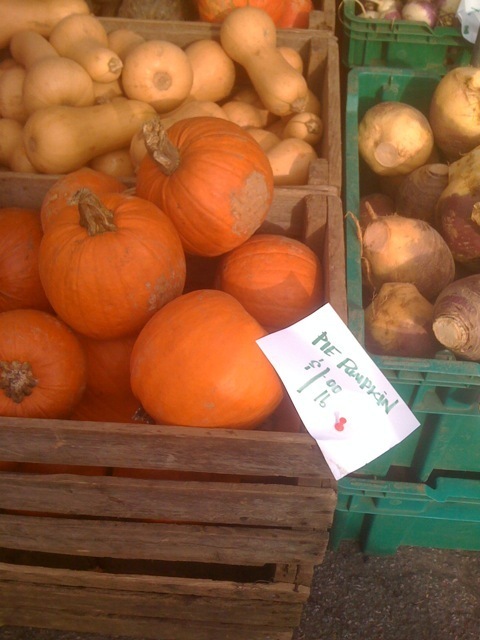 Kabocha, or Ambercup/Buttercup, squash is great for making pie, too! It’s drier, and even less fibrous, than sugar pumpkin. Good advice from Sarah, our resident farmers’ market employee. Thanks! I found it a little tough to get those last bits of guts out of my sugar pumpkin. Maybe I will try Kabocha or Ambercup/Buttercup next year.